I have been asked by the chair (Archdeacon Wayne Carney) and the secretary (David Frizelle) to speak to the report of the Council for Mission (pp 35-39). I am not a member of the Council for Mission, but I am a trustee of USPG (the United Society Partners in Gospel), which has a close working relationship with this diocese over the years, particularly to the benefit of the Diocese of Swaziland, which is part of the Anglican Church of Southern Africa (ACNA). I am also a former director of USPG in the Republic of Ireland and Northern Ireland. Both agencies or companies – which have been chaired in the past by Bishop Michael Burrowes and then by Bishop John McDowell – have been wound up over the past two years as part of the restructuring of USPG. One organisation will now work in facilitating Anglican dioceses and parishes through these islands to work in partnership with Anglican churches throughout the world in their needs. 1, Outline what funding from and partnership with this diocese has made a real difference in the past in the Diocese of Swaziland. 2, Update us what is happening today in the Diocese of Swaziland. 3, Update us on USPG in Ireland and in the Anglican Communion. In conclusion, I would like to explore some of the options that are available for this diocese to explore as we look at options for Partnership in Mission in the future. Swaziland is one of the poorest countries in the world. It is a tiny, landlocked African kingdom surrounded by South Africa and Mozambique. It has a population of just one million, but it has possibly the highest level of HIV/AIDS in the world: 40 per cent of the people there are HIV+, many children are born HIV+, and 20,000 new HIV cases are reported or diagnosed each year. But there are only 2,000 hospital beds in Swaziland. This means most of the people are left to die at home. To compound these problems, 40 per cent of the people are unemployed, and 69 per cent of people live below the poverty line. But for many people, the biggest problem is not HIV – it is the problem of what they are going to eat. With the support of this diocese and the Bishops’ Appeal, USPG Ireland worked to provide feeding programmes and training in horticulture and market gardening so that the diet of people and the ability of families to be self-sufficient can be improved significantly. To help this work, it was possible too to make use of previously under-used church lands. One of the major projects you have supported through USPG was the Luyengo Farm project. 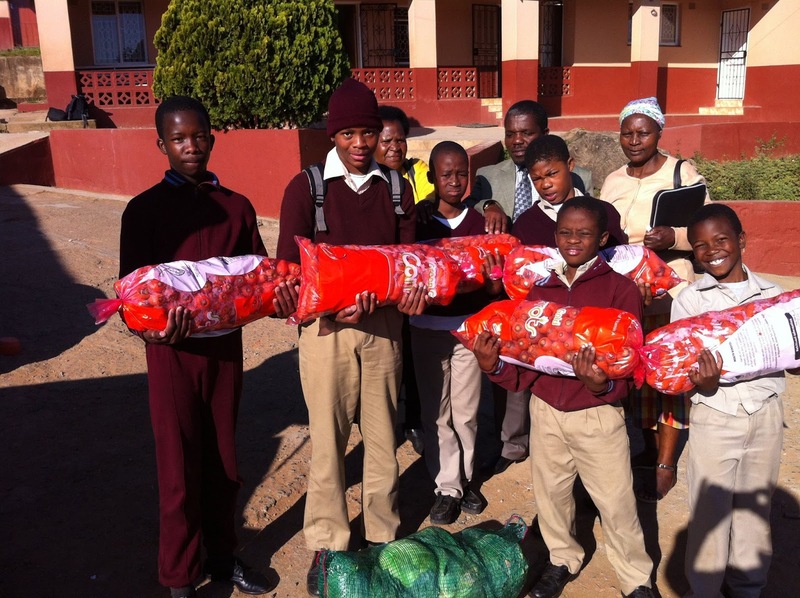 This was important as a teaching aid for local people and a source of employment, and it also became an income generator for the Diocese of Swaziland, helping to support many HIV/AIDs programmes, schools and care of the sick and orphaned. In 2014, ‘Bikers with a Mission’ – the Revd Andrew McCroskery and Canon Nigel Kirkpatrick – began from Saint Brendan’s Cathedral, Clonfert, on their ten-day bikers’ tour of the 30 cathedrals of the Church of Ireland raising awareness of and funds for USPG’s work in Swaziland. Their tour also marked the 300th anniversary of USPG in Ireland in 1714. 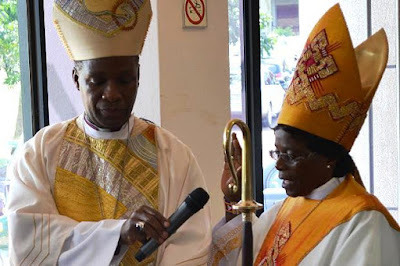 Bishop Ellinah Wamukoya, who became the first woman bishop in Africa in 2012, has visited this diocese, and was also one of the assisting bishops at the consecration of Bishop Kenneth Kearon in Christ Church Cathedral, Dublin, in 2015. Students from the Institute of Technology in Tralee have been particularly generous in helping the Luyengo Farm Project. The farm came to employ 30 people and went on to have a reasonable prospect of a sustainable commercial future. The Diocese of Swaziland consists of three archdeaconries, 16 parishes, three parochial districts and two chapelries, served by the bishop and 40 clergy, and with about 8,000 regular attending church members. 1, The Diocese of Swaziland is committed to the Green Anglican movement, which promotes environmental conservation and development work across Southern Africa. The diocese has been recognised as a leader in that work. 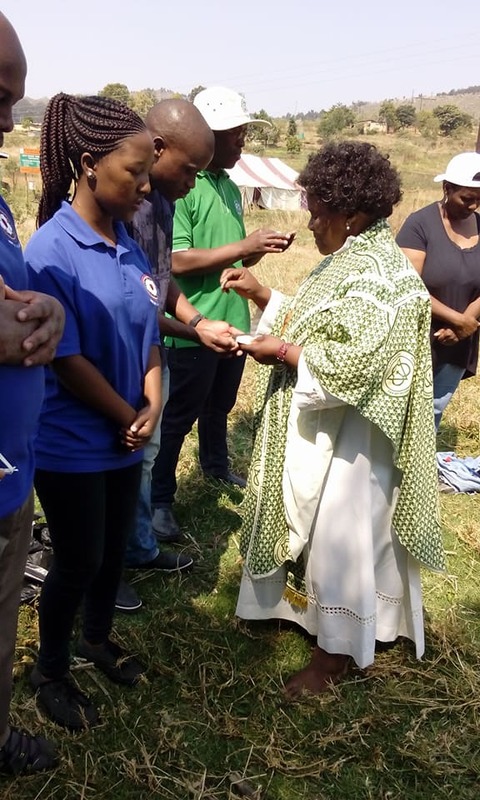 Young people in the Anglican Diocese of Swaziland recently completed a 450 km challenge to raise environmental awareness. They donated shoes, school uniforms and toiletries to schools along their route. 2, The diocese has about 15 Neighbourhood Care Points in the country where children are fed daily. The Bishop recently visited Mbava to see the start of building a new kitchen structure where she laid the foundation stone. The church also distributed maize bags and beans to over 100 families in the most affected communities in the Shiselweni and Lubombo regions of the country. This work, possible through assistance from the Church of Ireland and other companion dioceses, has responded to the nutritional needs of children who are orphaned and vulnerable. In the face of the drought, there were increasing demands on these resources. 3, Schools, especially in Mbabane, were affected by water shortage. The diocese, through help from Hope Africa and USPG Ireland, donated tanks and distributed water in four primary schools and one pre-school as an emergency relief and water harvesting solution for future use. The Diocese is drilling boreholes to harvest ground water for two parishes, and has erected three 10,000 litre water tanks to help the Mbava community with water harvesting, where fencing has also been donated to start a community garden that will supply vegetables to the care point. USPG is the oldest Anglican mission agency working overseas. It dates back to 1701, and is taking new steps forward to work in new and more meaningful partnerships, that are less about giving and receiving, both money and ideas, but more about empowerment, two-way relationships and building partnerships. Now USPG is taking a fresh look at its work and we are looking to new opportunities to develop these commitments. The work of USPG Ireland and USPG Northern Ireland is being integrated into the main work of USPG, and this promises to deliver wider engagement in mission for partner dioceses and parishes in the Church of Ireland. To share some idea of the breadth and scope of our work, USPG was recently named by the Diocese of Europe as the mission agency to support its work with refugees in Greece and southern Europe. Meanwhile, USPG produces Harvest, Advent and Lenten resources, which I have used successfully in my own parish. As USPG restructures in Ireland, these resources are being made available to dioceses and parishes throughout the Church of Ireland. USPG and the Diocese of Swaziland have been working together for some years to create a new development programme. Last year, USPG staff members visited Swaziland to meet Bishop Ellinah Wamukoyah and her colleagues, and Fran Mate, USPG Programmes Manager for Africa, was back there again in the past week. The discussions are still active, but it looks likely now that USPG’s future engagement in Swaziland will focus on community development, education, support for women, and protecting the environment. In these areas, USPG will be working in partnership with HOPE Africa, the development arm of the Anglican Church of Southern Africa (ACSA). USPG is also continuing to support leadership development in Swaziland and throughout the Anglican Church of Southern Africa. Positively, because of these new partnerships, but sadly, because of some past personnel problems, the Diocese of Swaziland is not in a position at the moment to receive funding from Ireland for the water tanks projects. So, while as a diocese we have had a very successful and positive relationship, with fantastic results from all contributions, circumstances beyond our control mean the Diocesan Council for Mission is going to have to re-examine ways of supporting mission work overseas in the future. For example, there is the possibility of supporting similar work through the Partners In Mission (PIM) Programme, which includes a number of costed programmes. Bangladesh, Health; North India, Health; North India, Tackling Slavery; South India, Justice; North India, Women’s Helpline; South India, Green Schools; Malawi, Community Development; Sri Lanka, Education; Tanzania, Children and Babies; Zambia, Justice; Zimbabwe, Tackling Stigma; South Africa, Livelihoods. Each parish or diocese commits to praying and giving. USPG is encouraging a minimum pledge from churches of £1,000 per year for their chosen programme. However, USPG realises that this is beyond the reach of some parishes and will welcome any commitment they are able to make. USPG guarantees that 100% of the giving will be dedicated to the chosen programme. Regular updates will enable prayers to be informed. With inspiring stories and pictures from its chosen programme, a church or parish will see the meaningful impact its giving is having on the community where the programme is based. Becoming a Partner In Mission will give the satisfaction of knowing this support has a major impact on lives and communities through the Anglican Churches. But that is me speaking as a Trustee of USPG and I am not a member of the Council for Mission. I am sure whatever the Council decides can bring about a fruitful three-way partnership between this diocese, USPG, and a programme in an Anglican diocese or province. Canon Patrick Comerford was speaking at the Diocesan Synod, the United Dioceses of Limerick, Killaloe and Ardfert, in Villiers School, Limerick, on 23 June 2018. The Rathkeale Pre-social Cohesion Group began working in Autumn 2013, faced with the dilemmas in a town that is the first in Ireland with a majority Traveller population. Today, Rathkeale is moving rapidly towards being a 100% Traveller town. Although most Travellers are not present on Census night, and the ‘trader Traveller’ men are absent from the town for most of the year, up to 80% of private property in the town may now be Traveller owned. Yet the poorer Travellers continue to find difficulties in accessing government services and supports. For its part, the mainstream community has moved in large numbers to the surrounding area, but continues to regard Rathkeale as its town. The Pre-social Cohesion Group has tried to fill many of the gaps left by other agencies and bodies, engaging with cross-cultural awareness education for members of both communities, encouraging greater openness to mutual understand, and organising workshops and meals together. Ráth Caola Le Chéile, a community group, has emerged from these workshops and focuses on getting to know each other’s cultures and ways better. Travellers have taken part in Tidy Towns efforts, and a project to renovate the Roman Catholic Parish Hall was initiated by a mixed group of travellers and mainstream community members, engaging in the fund-raising together. Both communities have come together for an annual retreat in Glenstal Abbey and for major feasts in the Church calendar, including Christmas lights and carols events, a shared Christmas dinner, Saint Patrick’s Day Parade and a Good Friday ecumenical event. The project has given comprehensive support to non-literate Rathkeale Travellers accessing State and other services, and this is a pressing need. The project facilitated meetings between Gardai and Travellers to discuss approaches to discuss the 2017 Christmas return of Rathkeale Travellers. The Mainstream Community has yet to come to terms with the loss of the town, while the Travelling Community sees its social and civil place through the lens of discrimination. Travellers consistently report prejudicial and even racist behaviour at an official level, and some claim being threatened with loss of benefits if they complain. Rathkeale Travellers see education, especially second level education, as attempted assimilation and resist sending their children to secondary school. The Rathkeale Travellers see themselves as a group apart and avoid association with other Traveller groups. They report being excluded from hotels, cafés, restaurants and public houses, but proprietors consistently report that the exclusion is based on behavioural issues rather than discrimination. Many people say there has been a softening of inter-community relationships as a result of the pre-cohesion project, and there have been significant gains. But these are fragile and rest almost on trust, which remains fragile. Within both communities, the conviction that the future can be different is weak. Funding and staffing remain a problem as is planning for the future. But the project offers a unique voice in this situation, speaking from a faith perspective, and offering a voice and presence from the three main churches at the heart of life in Rathkeale.